Shakopee, Minn. – June 11, 2018 – Cyber Power Systems (USA), Inc., a leader in power protection and management products, today announced the new release of its PowerPanel® Business Edition software. The software provides advanced power management for uninterruptible power supply (UPS) systems and network-connected power distribution units (PDU). PowerPanel® Business Edition v3.3 works with VMware vSphere® to allow for the graceful shutdown of virtual environments during extended power events. Used with VMware vCenter®, the software offers additional features to centralize control and visibility of virtualized environments and power conditions. PowerPanel Business Edition remains one of the only leading UPS power-management software solutions that is available completely free of charge. “Version 3.3 adds functionality for managing VMware ESXi® cluster environments, supporting the efficiencies demanded by IT departments, enterprises, and outsource providers. These needs include increasing application availability, resiliency, and automation,” said Dorian Haro, senior product manager at CyberPower. Out-of-the-box, configurable automated graceful shutdown sequence to allow IT professionals to protect their virtual environments from data loss or corruption. Used together with vCenter, the software provides ease of management to centralize control and visibility of virtualized environments and power conditions. Improved management of the virtual infrastructure with capabilities to shut down virtual machines, monitor clusters, monitor and shutdown of vApps, and monitor shared storage. Triggers vMotion to migrate virtual machines within a cluster, moving the virtual machine to an available ESXi host seamlessly, to keep applications operational during power events and maintain business continuity. 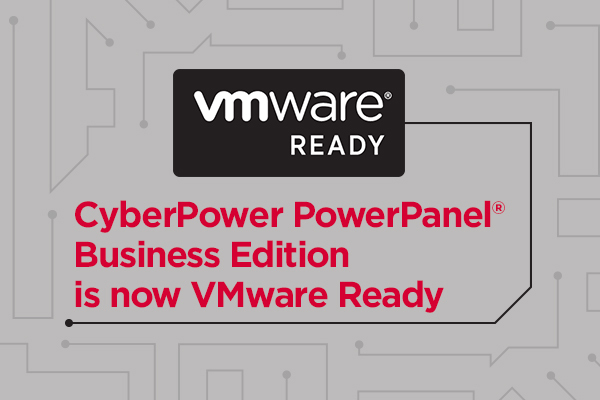 In addition to VMware, CyberPower Business Edition software is compatible with many types of operating systems including Citrix, Linux, Mac, and Windows. CyberPower PowerPanel Business v3.3 is available as a free download at https://www.cyberpowersystems.com/products/software/power-panel-business/. CyberPower designs and manufactures uninterruptible power supply systems, power distribution units, surge protectors, remote management hardware, power management software, mobile chargers and connectivity products. The company serves customers in enterprise, corporate, government, education, healthcare and small office/home office environments. CyberPower products are available through authorized distributors and sold by value-added resellers, system integrators, managed service providers, select retailers and online resellers. For more information, visit https://www.cyberpowersystems.com/.